Most contemporary New Yorkers would think twice about swimming in the city’s waterways. But a century ago, marathon swim contests captivated the city, with thousands of fans cheering on competitive swimmers who tested their endurance in New York Harbor and the city’s rivers. One of these competitors was 17-year-old Rose Pitonof. 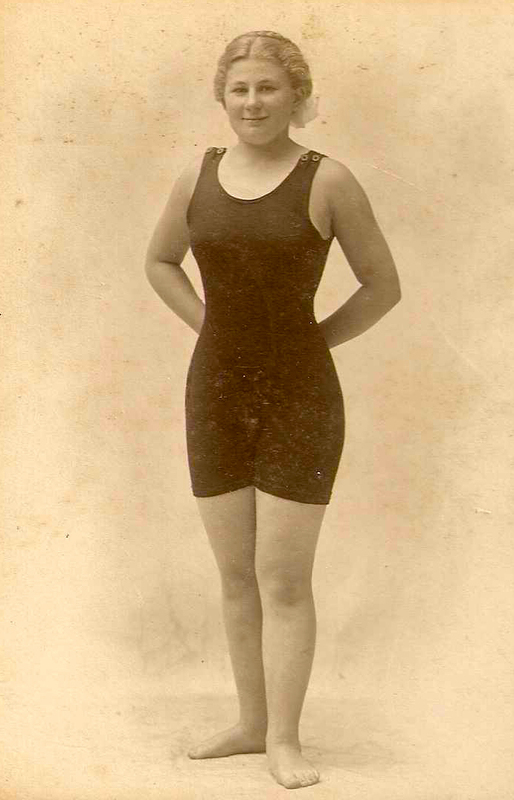 Born in 1895, the “swimming marvel,” as the New York Times later called her, won swim races in her home city of Boston. That was pretty impressive in an era when most people didn’t know how to swim, and it was still controversial for women to pursue any kind of athletics. On September 19, 1910, Pitonof attempted to swim the 17 miles from East 23rd Street in Manhattan to Coney Island’s Steeplechase Pier. According to the New York Sun, she completed the course—which took her down to the harbor and then to Norton’s Point on the western end of Coney Island (where Sea Gate is today) in five hours and six minutes. She did the same course a year later and won again, swimming 21 miles as she navigated three bridges amid choppy East River waters while doing the breast stroke. “Coney Island never held a more enthusiastic or demonstrative crowd than that which welcomed the girl swimmer at Steeplechase Pier yesterday afternoon,” wrote the New York Times on August 14, 1911. 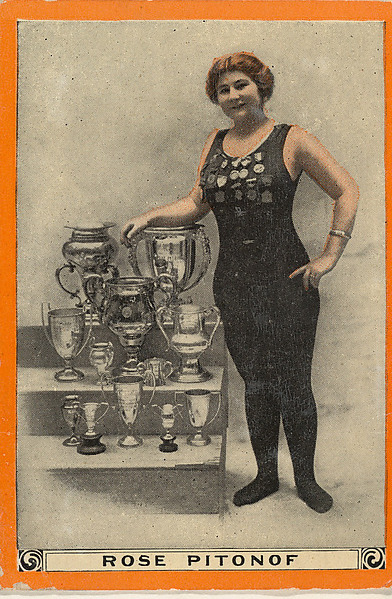 Pitonof wasn’t just an athlete—she was a performer too, and she worked the vaudeville circuit demonstrating high dives and other tricks. She attempted a few more long-distance swims in the 1910s, including an English Channel swim (which another teen swim sensation from Manhattan completed) and a route from Sandy Hook to New York, but was unable to finish either. 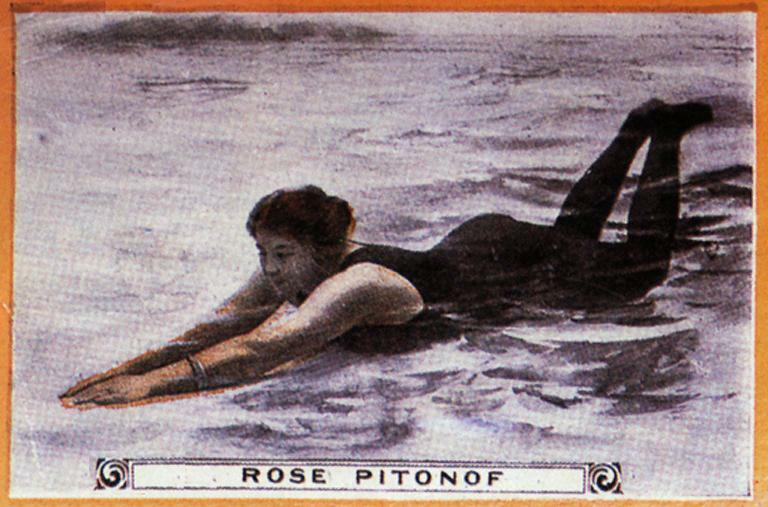 She died in 1984, a generation before the launch of the Rose Pitonof Swim, an annual event that recreates her record-breaking journey from the East 20s to Coney Island. This entry was posted on June 18, 2018 at 5:49 am and is filed under Brooklyn, Gramercy/Murray Hill, Sports. You can follow any responses to this entry through the RSS 2.0 feed. You can leave a response, or trackback from your own site. I prefer THIS post from today. Rose Pitinoff. ‘The Swimming Marvel’! Man, they don’t make nicknames up like they used to. This certainly looks like a very bouyant body. My great-grandparents were among the first residents of the brand-new suburb of Bensonhurst, moving in in 1890. They lived near the water and the eight children grew up as excellent swimmers. I think it was Bath Beach where they swam. We have lots of photos of them in those old bathing suits. 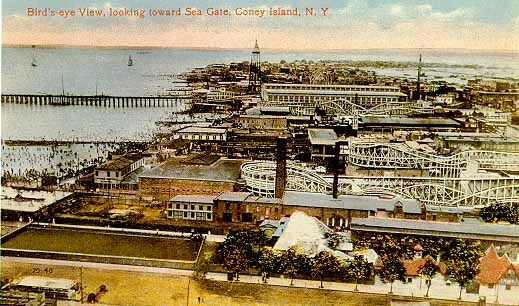 My grandmother, born Florence Graham, told me that she once swam from there to Coney Island. My cousins did not believe it was possible tho my grandmother was still a good swimmer in her elder years. I’m going to send them your interesting post to show them it could be done and at a longer distance. Thanks very much for this. That’s a great family history tidbit—and Bath Beach was a resort of its own at the time, with its own amusement park. I believe it’s where Shore Parkway is now. That was Ulmer Park at 25th or 26th Ave and Cropsey. We used to go there for picnics when I was very young (The rides were gone but I think there was still a carousel). Pre Belt Parkway of course. She’s braver than I am. Amazing story. This was in the days before the “Australian Crawl” or the freestyle swimming we know today. Back then everyone swam using the breaststroke. I remember my grandparents, born in the 1880s, never learned to swim freestyle. For what it’s worth, my grandmother swam freestyle, not the breaststroke. She was born in 1893 so her Bath Beach to Coney Island swim must have been about 1907-1917. She had lots of brothers and was very athletic in her youth. My grandparents moved to Bath Beach (23rd Avenue between Bath and Cropsey) in the late 1890’s. After a couple of years of summer rentals. Among others Edward G Robinson also lived on 23 Ave. They too were all good swimmers. My father swam from Captain’s Pier (20th Ave I think) to Coney Island . My Aunt Lucy swam the Hudson River from one end to the other. The article is in the New York Times archive but I can’t forward it.